Grand Opening of Café Nongshim! Join us for the Grand Opening of Café Nongshim! Tasty food samples will be provided for our grand opening celebration! There is something about Korean Noodles that gets the taste buds going, and today it will get your little ones’ imagination going too. Time: Drummers @ 10:00 a.m., Grand Opening Ribbon Cutting @ 10:10 a.m., Cultural Connection South Korea @ 11:00 a.m.
Are you looking for Korean cuisine that doesn’t require a plane trip across the world? Look no further. Café Nongshim will bring the hospitality and specialty cuisine of Seoul, Korea to the heart of Pretend City. Nongshim translates to instant noodles in English and they specialize in just that, instant noodles in a variety of different flavors and spices. We suggest their popular Kimchi Ramyun and their Neoguri Noodle Dish. Their products are both tasty and convenient! Cultural Connection (11:00am): Let’s Learn about South Korea> Join us in Orange Plaza at 11:00 a.m. as we listen to the national anthem of South Korea followed by a short lesson about where Korea is located, the flag or Korea, and different cultural traditions of the county in this educational and interactive lesson. 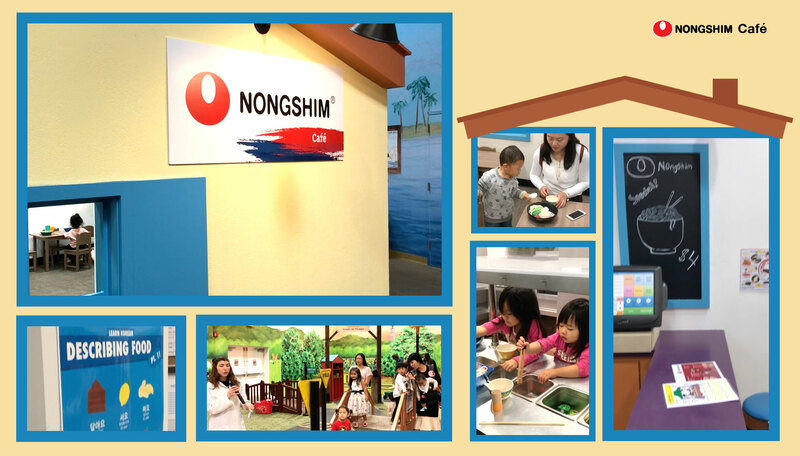 Play Partner: Nongshim, Pretendgineers and Brain Builders, our experienced stage staff of trained early childhood and child development educators, and grown-ups. Grown-up Tip: We are fortunate to live in a country that truly celebrates diversity. Take advantage of the many local culturally diverse neighborhoods such as Koreatown in Los Angeles. Visiting a town such as this or our new Korean café is a great way to expose your child to a different culture without the hefty cost of an airplane ticket.